So Facebook's buying Instagram. That might not be such a bad thing, but if you're one of those who can't stand any Facebook in her Instagram Cheerios, there's a solution. 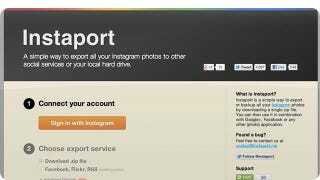 Instaport.Me will let you export all your photos right now, to wherever you want. The service is incredibly easy: All you do is go to the site, log into your Instagram account, and authorize the app. Then you can customize which photos to export: all, the last X-number, between two dates, photos others liked, and by #tag. That's it. Click export and your photos are downloaded in .zip format.